Super Pope Episode 1: Can't keep a bad demon down. 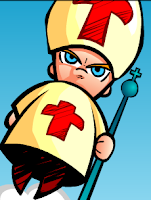 Here is a short flash anime which engages the Super Pope with a Demon. It is very much worth a watch. Where on earth did you find this, PC? Hilarious. I love it! Yea, that's a good cartoon. I saw it a few times before. I wish they would do another, with him taking on some form of heresy, or liberals, or abortion / birth control, etc.